For years, 50 Cent tried to brand his entire company as the toughest of the tough. 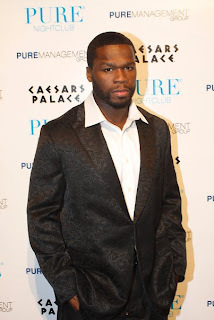 But, after making enemies out of 90% of the hip hop community and fans, 50 Cent has sharpened his business skills. The head of G-Unit Enterprises has been working hard to alter his image from a gangster to a businessman. 50 Cent has expanded his company to include the successful film company, Cheetah Vision Films. The new company has already produced over five films. Lionsgate Entertainment, the distributor for both Tyler Perry and Ice Cube, recently inked a $200 million deal with his company for three new projects. Dominating the film industry, 50 Cent is not quite done with the music scene. 50 Cent has been said to be recording a new album and he expanded G-Unit Records to include G-Note Records. The sub-label already has a signed artist, Governor, a former act of Grand Hustle, T.I. 's label. 50 Cent is expanding all of his businesses in order to catch back up with Jay-Z and Diddy. In an effort to make G-Unit Records more appealing to the mainstream, he has signed DJ Pauly D, one of the "Jersey Shore" stars, to his label. The rumor has been circulating for weeks and was recently confirmed by in-house G-Unit DJ, Whoo Kid. DJ Whoo Kid said 50 Cent is trying to make music for everyone in the future, so he is adding all types of artists to G-Unit Records.